Don Bluth, the American animator who made a career of enchanting children while simultaneously making them run crying from theaters, is looking to return to the world of animation. Bluth’s last film, the space opera Titan A.E., was released 15 years ago, and now the animator has launched a Kickstarter campaign to bring his 1983 video game Dragon’s Lair to the big screen. Readers of a certain age probably remember passing by Dragon’s Lair at their local arcade, but never playing since it was so damn expensive. The game was unique in that it utilized Bluth’s animation and full-motion video, pulling off the brilliant graphics and gameplay by utilizing the then-vast storage capabilities of Laserdisc technology. The classic video game spawned several sequels and home ports, as well as a short-lived cartoon series. Now, Bluth and partner Gary Goldman are raising gold coins to bring Dirk the Daring, Princess Daphne, and big bad Singe to the big-screen. “Join us in this adventure as we prepare to bring Dragon’s Lair to a new generation!,” the Kickstarter page exclaims. As with most crowd funding ventures, the rewards range from postcards and lanyards on the low end to a hand-drawn caricature by Don Bluth himself for the high rollers. “Fans have been begging us to do a major motion picture,” says the site, and now if you have $2,500 burning a hole in your chain mail, you can help. 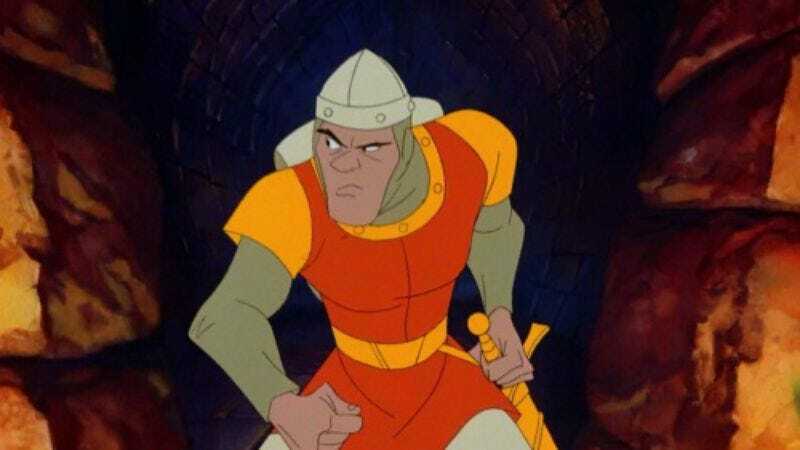 Perhaps the most noteworthy item about this Kickstarter is that Bluth and partner Gary Goldman intend to utilize hand-drawn animation for Dragon’s Lair. Bluth’s Titan A.E. combined computer-generated images as well as traditional animation, and is one of the last traditional animated features released theatrically in the U.S. (the other being The Simpsons Movie). Bluth and Goldman were involved in some of the biggest animation hits of the ’80s, including An American Tale and The Land Before Time, and are apparently trying to bring back a style that has fallen by the wayside in recent years. Click here to donate.